A schema (sometimes known as "data model") can be described as the structure of a dataset, or, more accurately, a formal definition of a dataset’s structure. Each dataset has its own unique structure (schema) which includes feature types, permitted geometries, user-defined attributes and other rules that define or restrict its content. How Does FME Handle Schemas? When you create a new workspace, FME reads the input dataset and creates a workspace definition of the schema. Generally it will also create a writer schema, that is, a definition of the structure of the writer. Writer schemas could be called "logical" schemas since they don’t physically exist at that point. Below is a reader and writer schema as they appear in Workbench. Source data is on the left, and destination data is on the right. Each item is a separate feature type. Here, there is one source and one destination feature type, and each feature type has a set of attributes. A new workspace will usually have identical source and destination schemas; but this is not always possible – particularly when the source and destination formats are different. In these circumstances, FME will attempt to compensate for any differences between source and destination schema. The workspace can then be edited and the destination schema changed as required; for example attributes can be added, removed or renamed. One of the real powers of FME is the ability to edit destination schemas and transform data to match during processing. A schema is made up of many components. Some of these relate to a dataset as a whole; for example feature types belonging to a dataset are regarded as part of the overall schema and are depicted in the Workbench canvas window. However, some parts of the schema relate specifically to a single feature type only. Attributes are one such component. These components are shown in the properties dialog of a feature type. Above: The Feature Type dialog has a number of tabs that display information. 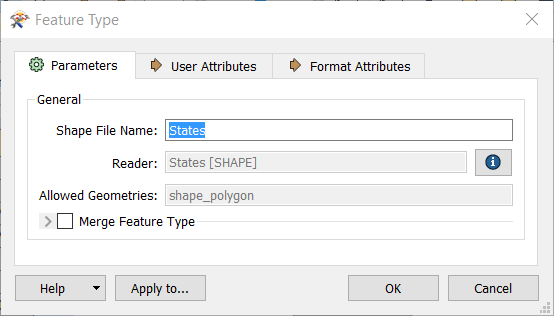 Click the Parameters tab to view the feature type name, the name of the parent dataset for the feature type, and permitted geometry types. Above: The User Attributes tab shows a list of attributes present on the feature type. Each attribute is defined by its name, data type, width, and number of decimal places. You can edit the attributes on a writer (destination) dataset to create the required output. The default schema that FME creates is one suitable for a Quick Translation. When there is a need to customize the output schema, edits can be made using Workbench. Schema editing is the process of altering the destination schema to customize the structure of the output data. One good example is renaming an attribute field in the output. Rename an Attribute: Any attribute on the destination schema can be renamed. To rename an attribute open the Feature Type dialog and click the ‘User Attributes tab. Click the attribute to be renamed and enter the new name. Change an Attribute Type: Any attribute on the destination schema can have a change of type, for example changing ID from an integer to a float. 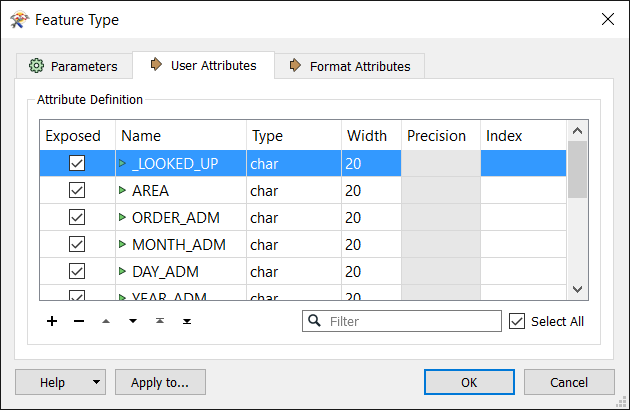 To change an attribute type open the Feature Type dialog and click the User Attributes tab. Use the Data Type field to change the type of an attribute. Rename a Feature Type: To rename a destination feature type (for example rename roads to updated_roads) open the Feature Type dialog. Click the Parameters tab. Click in the Feature Type name field and edit the name as required. Change a Geometry Type: To change the permitted geometry for a feature type, (for example change the permitted geometries from lines to points) open the Feature Type dialog. Click the Parameters tab. Choose from the list of permitted geometries. This field will be greyed out where the format permits any geometry type. Change a Dataset (Move a Feature Type): When more than one destination dataset is defined, you can switch a feature type from one destination dataset to another, using the drop-down list under the Parameters tab. Schema Mapping is the means by which a datasets structure can be transformed. In FME Workbench, one side of the workspace shows the source schema (what we have) and the other side shows the destination schema (what we want). Schema mapping is the process of connecting the source schema to the destination schema in a way that ensures the right source features are sent to the right destination feature types and the right source attributes are sent to the right destination attributes. Attribute Mapping is the process of connecting source attributes to destination attributes. 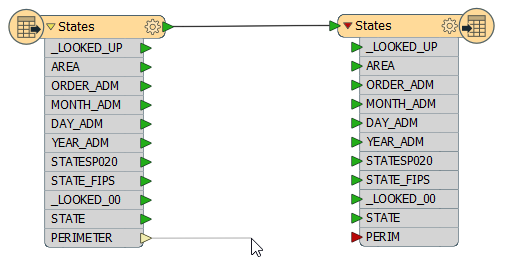 In FME Workbench, feature mapping connections (or links) are shown with a thick, black arrow. Attribute connections appear as a gray arrow. In Workbench, attribute mapping is sometimes implied rather than visualized, and no connecting arrow is shown. The color of the port indicates the connection status. Green indicates a connected attribute. Yellow indicates a source attribute unconnected to a destination, and red indicates a destination attribute that is not connected to a source. 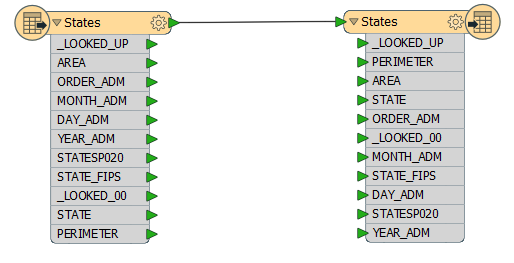 Attributes with the same name in source and destination are automatically connected. In the image above, all of the source attributes are connected to their destination attributes, as indicated by the green ports. Note: The name is case-sensitive, so ROADS is not the same as roads or Roads. 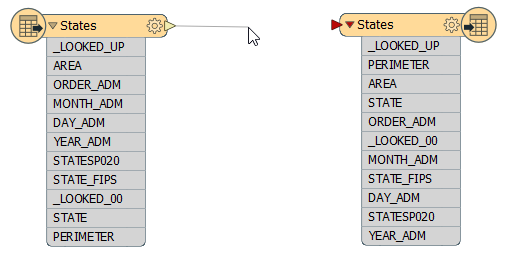 In most cases, FME automatically fills in basic schema mapping in a new workspace. The schema mapping can then be edited as required. In Workbench’s intuitive interface, feature type and attribute connections are made by dragging connecting lines between these parts of the schema. Feature Mapping is carried out by clicking on the output port of a source feature type, dragging the arrowhead across to the input port of a destination feature type, and releasing the mouse button. Attribute Mapping is carried out by clicking on the output port of a source attribute, dragging the arrowhead to the input port of a destination attribute, and releasing the mouse button. Here, feature mapping has already been established and attribute connections are being made. A new connection from PERIMETER to PERIM is being made. The other attributes have matching destinations so they are connected automatically (implied connection). Note the green, yellow, and red color coding showing which attributes have been connected.